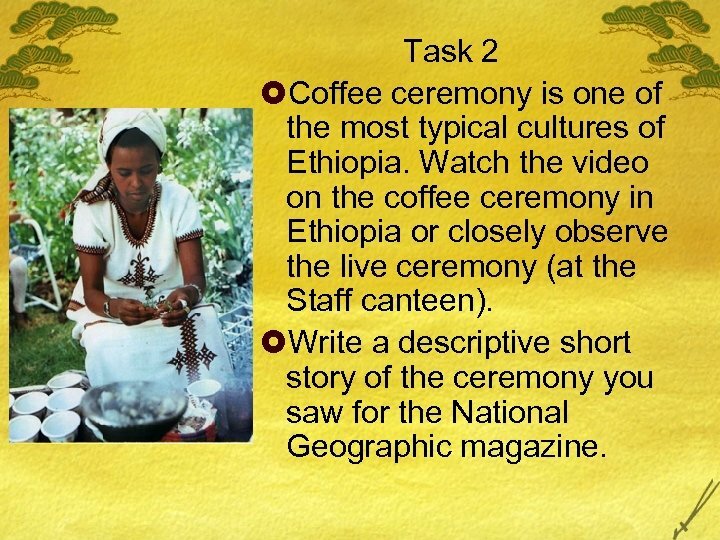 Task 2 £Coffee ceremony is one of the most typical cultures of Ethiopia. 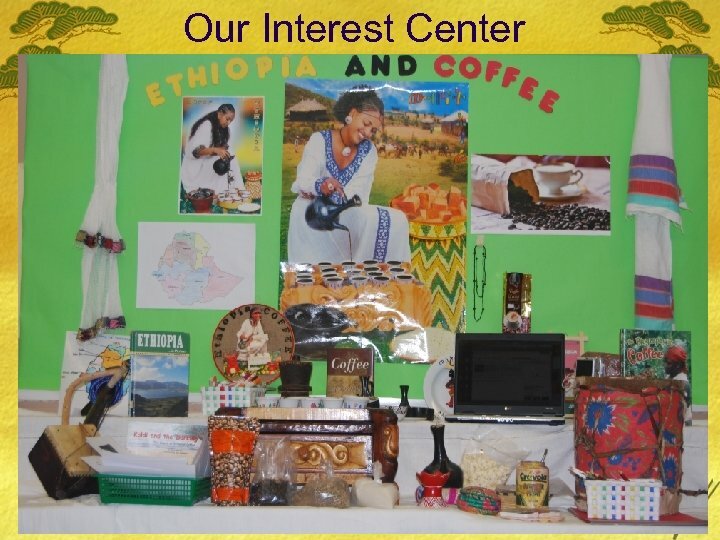 Watch the video on the coffee ceremony in Ethiopia or closely observe the live ceremony (at the Staff canteen). £Write a descriptive short story of the ceremony you saw for the National Geographic magazine. 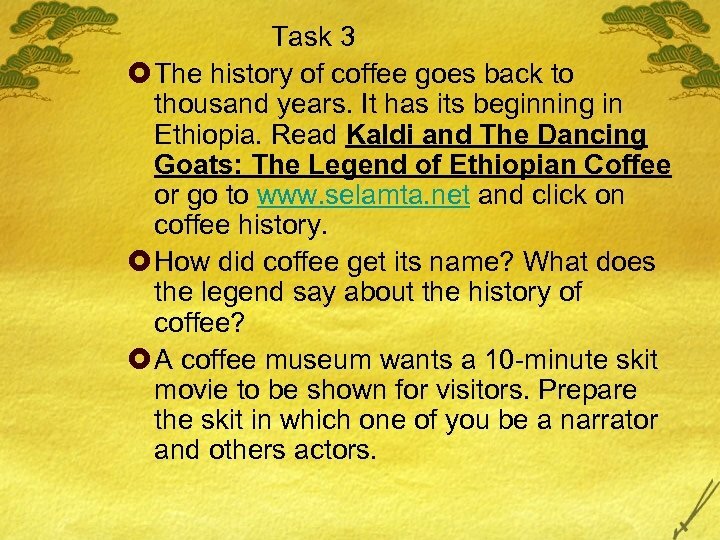 Task 3 £ The history of coffee goes back to thousand years. It has its beginning in Ethiopia. Read Kaldi and The Dancing Goats: The Legend of Ethiopian Coffee or go to www. selamta. 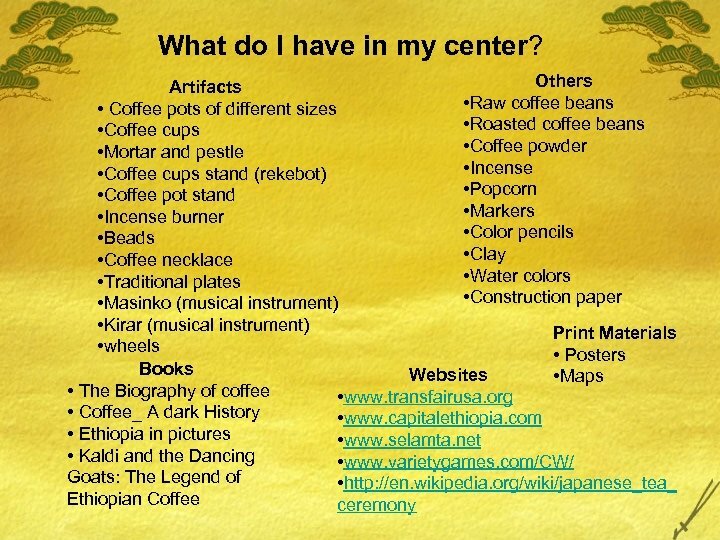 net and click on coffee history. £ How did coffee get its name? What does the legend say about the history of coffee? £ A coffee museum wants a 10 -minute skit movie to be shown for visitors. Prepare the skit in which one of you be a narrator and others actors. 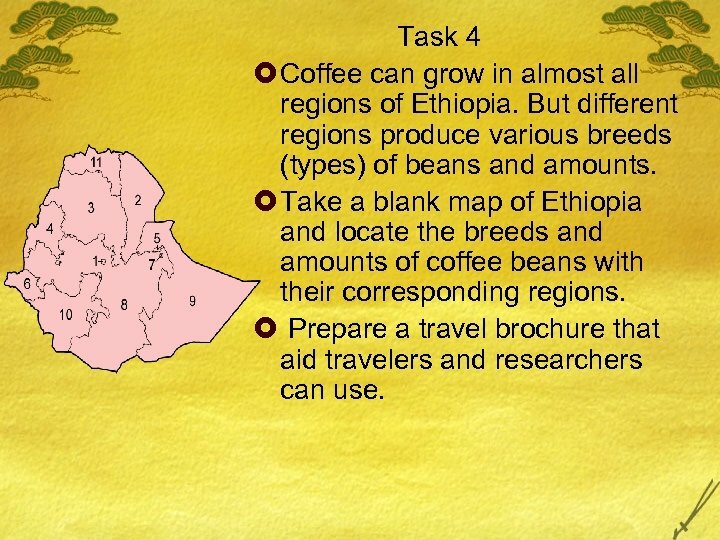 Task 4 £ Coffee can grow in almost all regions of Ethiopia. But different regions produce various breeds (types) of beans and amounts. £ Take a blank map of Ethiopia and locate the breeds and amounts of coffee beans with their corresponding regions. £ Prepare a travel brochure that aid travelers and researchers can use. 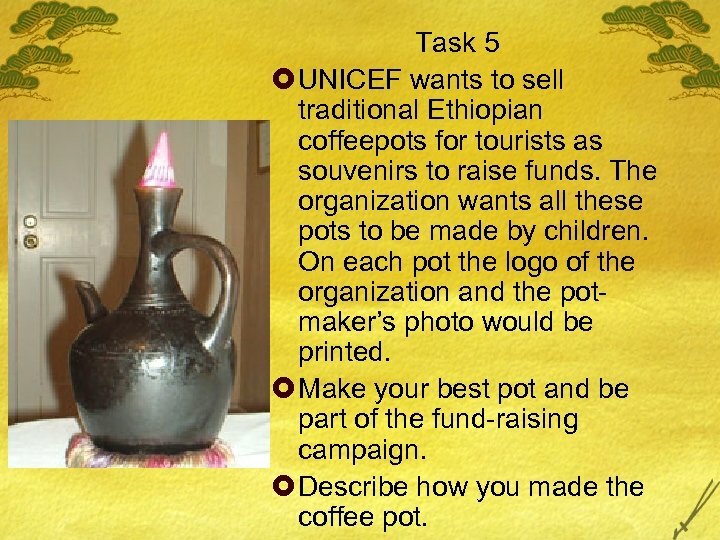 Task 5 £ UNICEF wants to sell traditional Ethiopian coffeepots for tourists as souvenirs to raise funds. The organization wants all these pots to be made by children. On each pot the logo of the organization and the potmaker’s photo would be printed. £ Make your best pot and be part of the fund-raising campaign. £ Describe how you made the coffee pot. Task 6 £ Coffee is the backbone of Ethiopian economy. Every morning the Ethiopian radio has been broadcasting an Amharic song about coffee for the last 30 years. 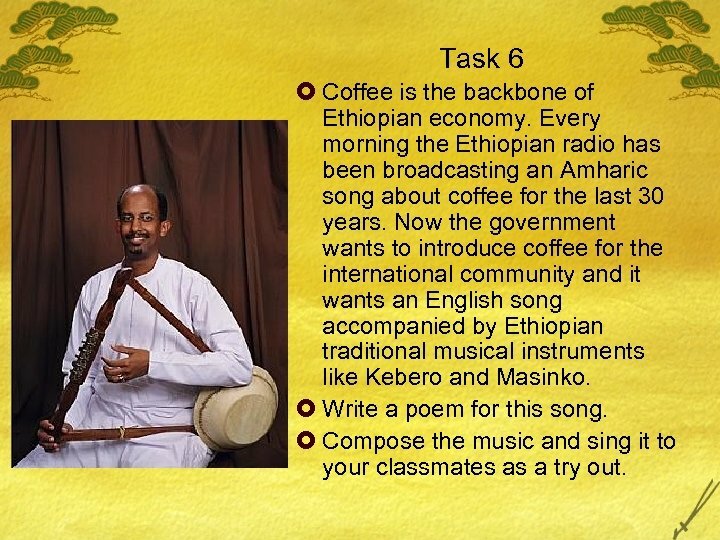 Now the government wants to introduce coffee for the international community and it wants an English song accompanied by Ethiopian traditional musical instruments like Kebero and Masinko. £ Write a poem for this song. £ Compose the music and sing it to your classmates as a try out. 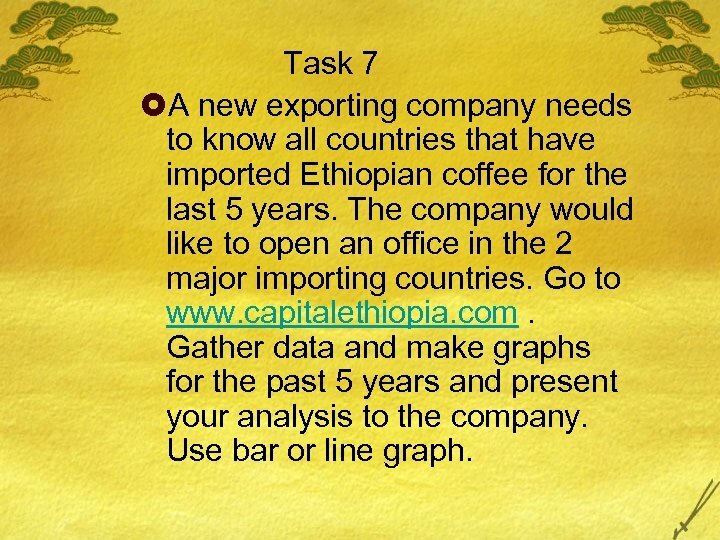 Task 7 £A new exporting company needs to know all countries that have imported Ethiopian coffee for the last 5 years. The company would like to open an office in the 2 major importing countries. Go to www. capitalethiopia. com. Gather data and make graphs for the past 5 years and present your analysis to the company. Use bar or line graph. 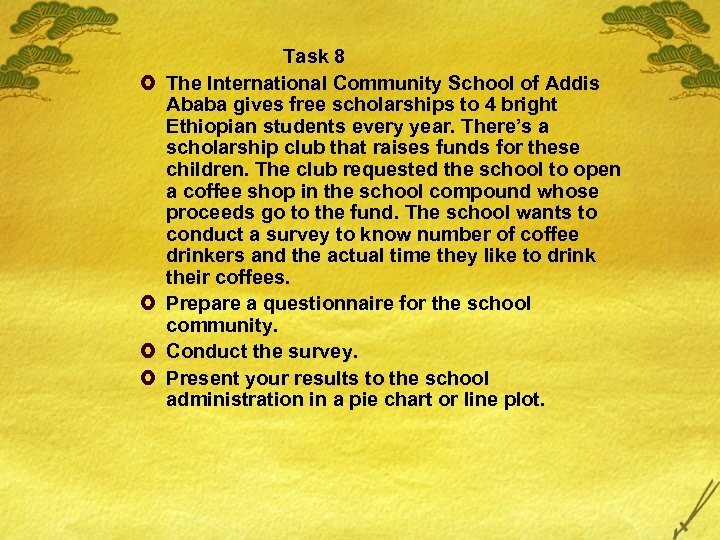 £ £ Task 8 The International Community School of Addis Ababa gives free scholarships to 4 bright Ethiopian students every year. There’s a scholarship club that raises funds for these children. The club requested the school to open a coffee shop in the school compound whose proceeds go to the fund. The school wants to conduct a survey to know number of coffee drinkers and the actual time they like to drink their coffees. Prepare a questionnaire for the school community. Conduct the survey. Present your results to the school administration in a pie chart or line plot. Task 9 £ People decorate themselves with jewelries made of different beads. These days coffee jewelries are becoming very popular. Some people are making coffee bean jewelries a means of their income. The International Evangelical Church organizes an NGO bazaar every last Saturday of each month where people sell artifacts. 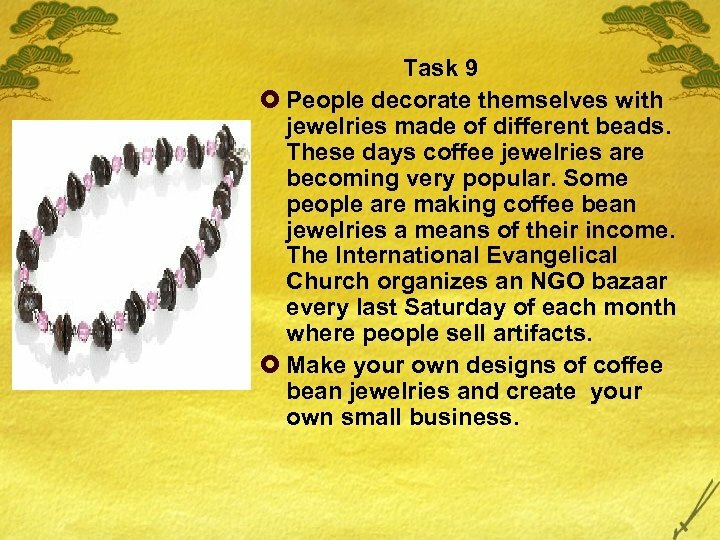 £ Make your own designs of coffee bean jewelries and create your own small business. 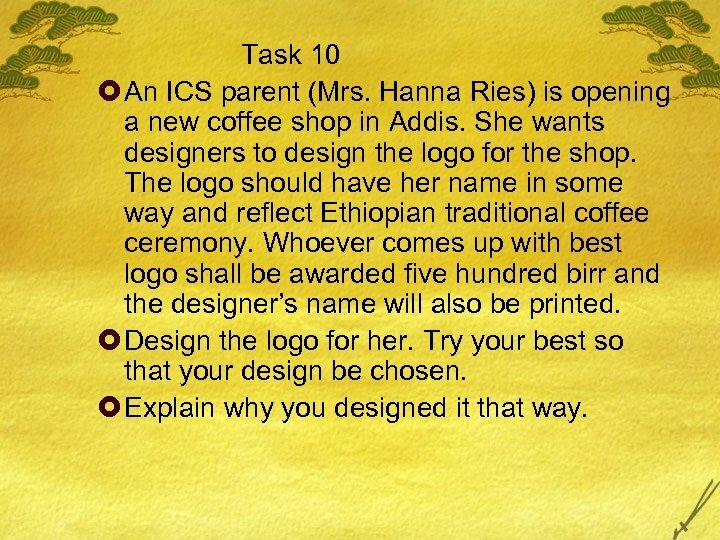 Task 10 £ An ICS parent (Mrs. Hanna Ries) is opening a new coffee shop in Addis. She wants designers to design the logo for the shop. 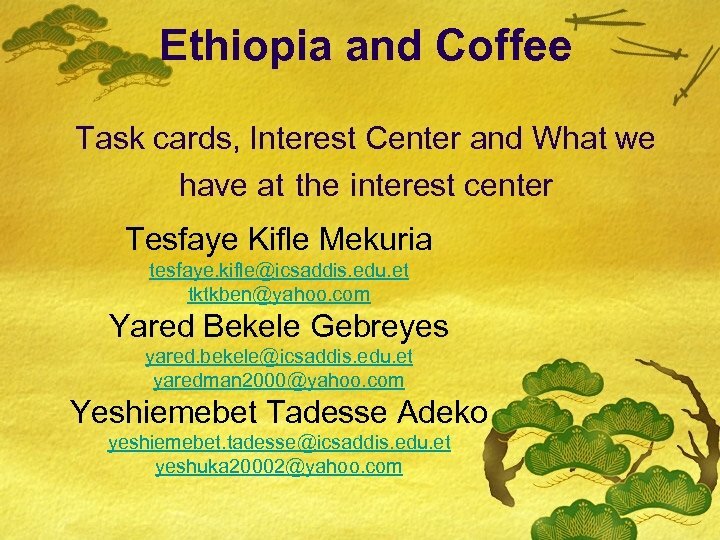 The logo should have her name in some way and reflect Ethiopian traditional coffee ceremony. Whoever comes up with best logo shall be awarded five hundred birr and the designer’s name will also be printed. £ Design the logo for her. Try your best so that your design be chosen. £ Explain why you designed it that way. Task 11 £ Organic coffee has become very popular globally. 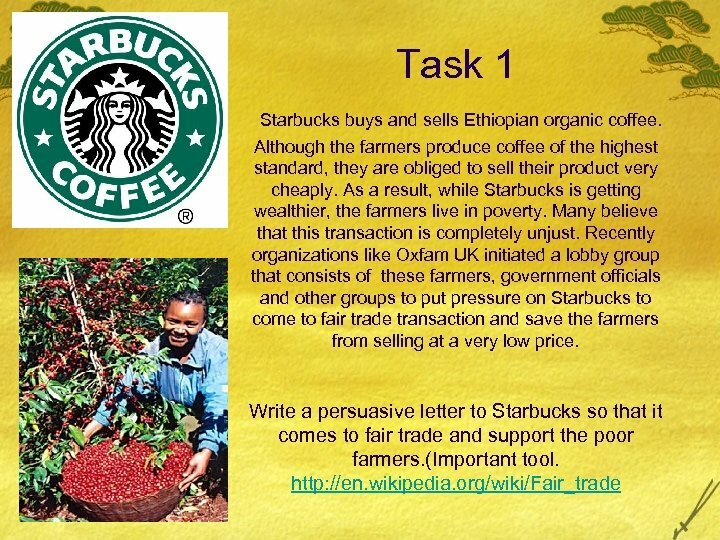 Organizations like Oxfam UK want people to buy organic coffee that comes through fair trade. However, many customers do not know whether the coffee they buy comes through fair trade or not. £ Go to www. transfairusa. org. Get the most out of the information provided and be an expert in this topic. Share your expertise to the ICS community. 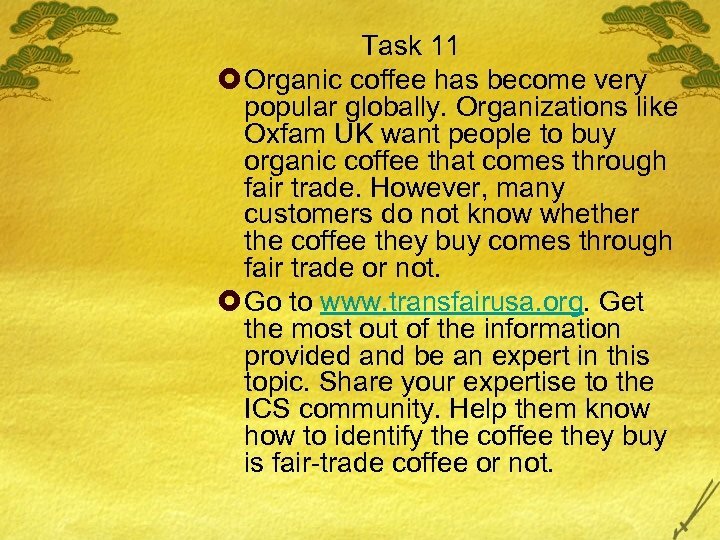 Help them know how to identify the coffee they buy is fair-trade coffee or not. 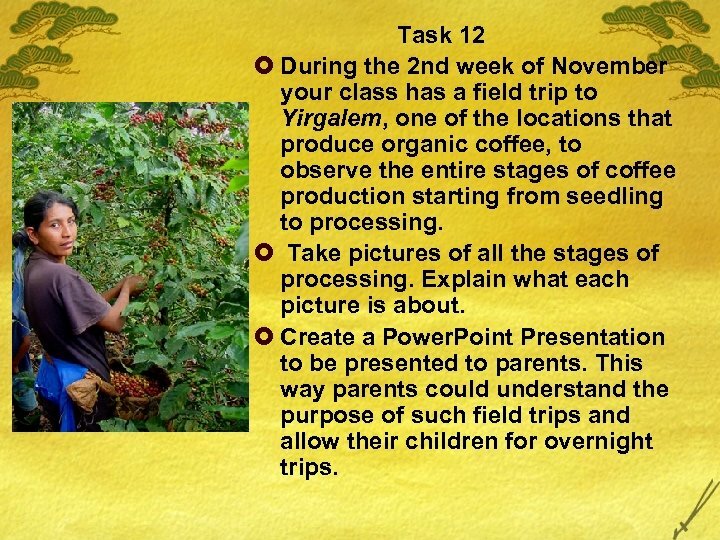 Task 12 £ During the 2 nd week of November your class has a field trip to Yirgalem, one of the locations that produce organic coffee, to observe the entire stages of coffee production starting from seedling to processing. £ Take pictures of all the stages of processing. Explain what each picture is about. £ Create a Power. Point Presentation to be presented to parents. This way parents could understand the purpose of such field trips and allow their children for overnight trips. Task 13 £ ICS is celebrating International Day on November 25. People from over 60 countries attend the celebration and want to show something peculiar about their respective countries. 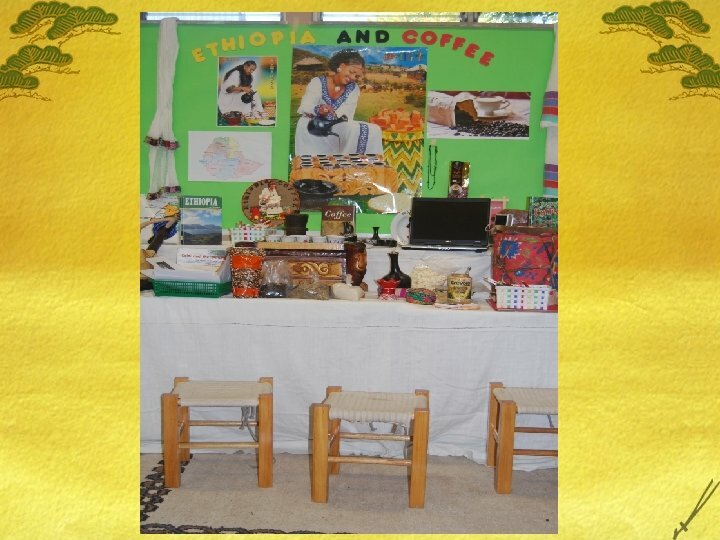 £ Prepare a typical coffee ceremony for that day to show Ethiopian unique culture. Remember that you should present Ethiopia in the best frame of picture. Decide on the price of coffee per cup and sell it the school community. Calculate your expenses and give your profit to charity. Task 14 £ www. varietygames. com/CW/ is a website that helps you to create you own cross word puzzles and add it to the website for fun. 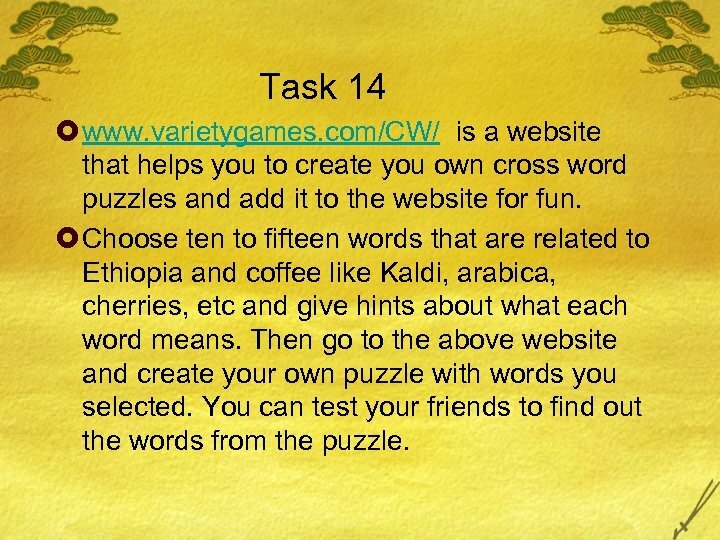 £ Choose ten to fifteen words that are related to Ethiopia and coffee like Kaldi, arabica, cherries, etc and give hints about what each word means. Then go to the above website and create your own puzzle with words you selected. You can test your friends to find out the words from the puzzle. Task 15 £ Read the information on http: //en. wikipedia. org/wiki/japan ese_tea_ceremony. 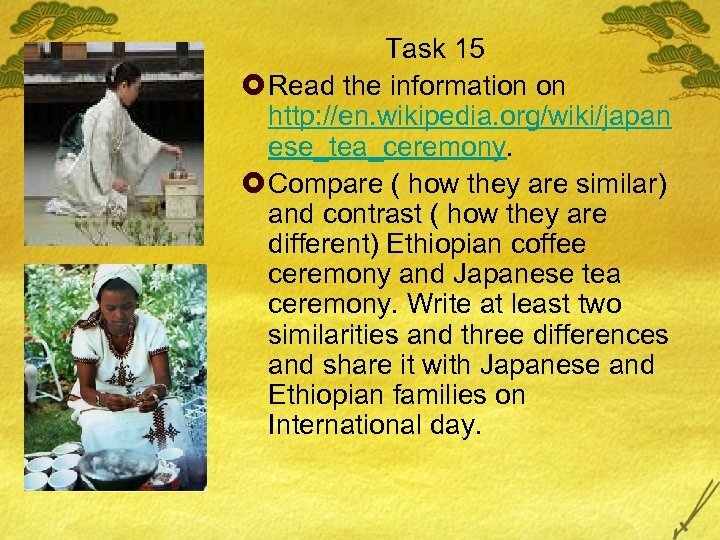 £ Compare ( how they are similar) and contrast ( how they are different) Ethiopian coffee ceremony and Japanese tea ceremony. Write at least two similarities and three differences and share it with Japanese and Ethiopian families on International day.